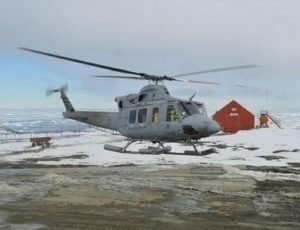 Rescue of Czech scientists in Antarctica – W.A.P. Members of the Argentine armed forces rescued a crew of 13 scientists from the Czech Republic that was stranded in Antarctica, under adverse weather conditions. On February 26, the Joint Antarctic Command (COCOANTAR) received from the Command of the Southern Naval Area (ANAU) a request made by the 3rd Naval Zone of Chile, with the aim of rescuing scientists from the Antarctic Institute of the Czech Republic. 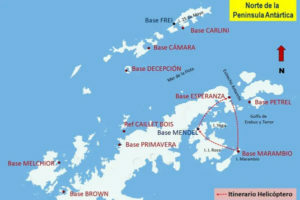 The ships of the Chilean Navy had not been able to rescue them due to sea conditions in the area of ​​Ross Island, to the North of the Antarctic Peninsula, where the Czech Base Johann Gregor Mendel Station (WAP CZE-NEW) is located. The operation was in charge of the Joint Antarctic Command (COCOANTAR), who received the request for rescue from part of the scientific endowment of the Czech Antarctic base . The aerial operation for the rescue began and finally, on Saturday, March 2, a Bell 412 helicopter of the Argentine Air Force and a DH6 Twin Otter aircraft, in support of Marambio Base (WAP ARG-21) , managed to transport the 13 Czech scientists and 800 kilos of cargo to Base Esperanza (WAP ARG-Ø4), where they were provided with accommodation, health care and given the necessary attention in waiting for their return to the home Country.